Gymnasts registered during school year are enrolled and billed through May. Summer gymnasts are enrolled and billed through July. Tuition is due on the 1st of each month. Late fees will be added to accounts not paid on time. Drop forms must be filled out and placed in the lobby payment box 2 weeks prior to dropping a gymnast and freezing your billing cycle. Accounts with a positive balance will not be refunded; however, the money will stay in your account for 9 months. Tuition untouched for 9 months will be placed in our general fund and your account will be deleted. Already Registered with Big CATS Gymnastics & Tumbling LLC? 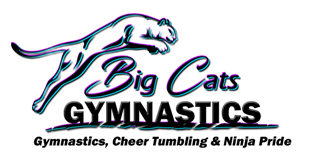 New to Big CATS Gymnastics & Tumbling LLC? If you have taken classes before with Big CATS Gymnastics & Tumbling LLC and you have given us your e-mail address, try the forgot your password link. If not, please contact the office to give us your e-mail address and to set your password.